Water Buttercup has finely-divided leaves and flowers during the summer months. Water Buttercup has long, branched stems that emerge from both trailing runners and buried rhizomes. The leaves are finely cut into thread-like divisions (white) or flattened divisions (yellow) and either attach directly to the stem or have a very short leaf stalk. Leaves emerge along the stem in an alternate arrangement and are usually stiff enough to hold their shape when lifted out of the water. 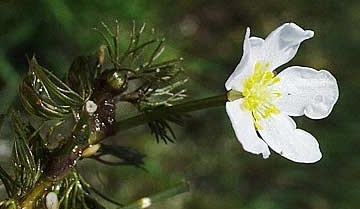 Water buttercup produces either yellow or white flowers from June to September. Very common all around the United States. Dibrox® herbicide is effective in treating water buttercup. You can order these products on this website.